In a recent post about One Dead Media I poked around the demise of edge punched cards as a possible exception to my rule that technologies don’t go extinct. I wrote: “It is hard to find an old technology that is not available in any form any where on earth. But today I may have found one.” I then unrolled plenty of pictures of this punched card system in use only a few decades ago but seemingly completely displaced by computers since then. When I was a kid (30 years ago), I had the strange hobby of collecting fingerprints of friends. There were companies that made “fingerprint kits” consisting of ink, powders for lifting prints, cards for collecting prints on, etc. The cards you put prints on typically used this “edge-notched” technology, so you would classify prints, then cut out the appropriate notches along the top of the card. You could then use a pencil to filter through your deck. 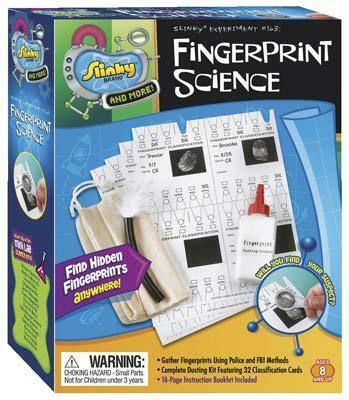 A quick search shows there’s at least one commercial “kids fingerprinting kit” out there, and if you look close at the picture, you can see they continue to take advantage of edge-notching. Indeed they do. You can get a brand new set of edge-punch cards from Slinky Toys for $10.19 here. Note the drawing on the cover of the box. What this means is that this technology is not yet extinct. Endangered, yes. But still being manufactured. It really never ceases to amaze me how persistent technologies are. They just won’t die. Technology is knowledge, it doesn’t have to be in actual use to have the potential for usefulness, and if it does have any use at all, that potential seems unlikely to disappear. To actually go extinct it would have to somehow disappear from the body of all human information. But then, how would we know that it had ever existed? I’m sure there are such things that have been lost – ancient tribal cultures’ never-written knowledge about ways to use and manipulate local resources surely include many things that have been lost forever. But once that knowledge is recorded in a fixed medium, I don’t see how you can ever say it’s “extinct”, even if not currently in direct use… It’s having once existed gives it the potential for rebirth, or at least for evolution and merging into something else useful. Has anybody done a “tree” of human technology showing that sort of evolution? I think it would be fascinating, but of course also terribly complex. Regarding the comment about Hollerith punch-card systems still in use, try Cardamation Corporation http://www.cardamation.com/. They are still quite happy to sell you cards, card-punch, reader, sorter, collator, etc. The early Allen Digital organs used hollerith cards to add extra stops on a temporary basis (Approx 1970 – mid 80s). I play one such organ (circa1981) in church and use the system regularly. An extensive library of cards is still available from Allen Organ Co. Comparing old school technology like this to ‘new school’ technology of, say, a hosting centre, why is it that the old stuff looks so much more impressive than a lots of gray racks with gray boxes with gray cables and some blinking lights? speaking of punch cards, have you seen any evidence of Hollerith-style punch cards still in use? This discussion took place some seven years ago. I have come across it after being asked by a colleague to talk about the edge-notched cards in a seminar on the use of electronic media for historical research. I am a retired history professor, In the the 1970s, I used edge-notched cards when working on my PhD. It proved to be an excellent means for building and using my data base, and it continued to serve me for my research for a few years after finishing my PhD. Considering the huge number of cards I filled for over ten years, they still serve me occasionally in my research, although I have been using computers for several decades by now. I even built a special chest of drawers to keep them well in order. It would take another lifetime to transfer all the hand-written material to a computer.